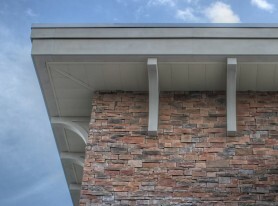 Architectural Augmentations manufactures fiberglass corbels or brackets made from fiberglass reinforced polymer. We make simple brackets like the ones pictured on the Publix grocery store as well as complex ornate decorative corbels. Each wall bracket comes standard with white marine-grade gel coat to accept final paint finish on site or can be made to any color or texture imaginable. We offer many standard profiles as well as custom corbels. We have been manufacturing polymer composite products in America for over 20 years so specify and purchase our products confidently.